#2 – I danced and mimed at Dance Across Birmingham! Why is this significant? Because I didn’t die doing it! Dance Across Birmingham is hosted by the Alabama Dance Council (ADC) and is a creative ritual for me. My adventurous self gets to frolic between any dance genre that tickles my fancy. For one Saturday out of the year, members of ADC provide free dance classes for the Birmingham community and beyond. You can learn everything from ballroom dancing to salsa to belly dancing to Bollywood. I love it! It gives me a chance to stretch my dance limits and be uninhibited with a group of strangers. No one judges your stumbling feet and flailing arms as you also learn with those who are classically trained. The instructors make sure that you have fun in all of your awkward glory and you meet some incredibly cool people in each class. During lunchtime, the instructors become the performers and you watch them explode with excellence in their respective genres. Asian-inspired awesomeness, hip-hop glory… it’s a beautiful parade of talent, skill, and passion.. and I’ve always wanted to know what it would feel like to be on that stage. Well, that dream became a reality this year thanks to Sistah LaVondia Smith, Founder and Artistic Director of Nathifa Dance Company & Outreach, LLC and Rosemary Johnson, Executive Director of the Alabama Dance Council. I was elated to dance with Sistah LaVondia and NDC because of their powerful and colorful African dancing and drumming. They are a sight to behold and a force to be felt! I had admired them since they began 25 years ago. If that wasn’t enough excitement, I performed a mime piece with my Troupe and was infused with strength! What an awesome 1-2 punch of goodness! Fear is the only thing standing between you and Glory. For decades I was scared of African dancing because of my respiratory issues. I was haunted by a fear of having an asthma attack mid-performance, so I cowardly never tried to learn it with full capacity of heart. Wow… to think of how much I was missing out! After that performance with NDC and a few others, I was offered the opportunity to join the Company. I was grateful and honored, to say the least. What can I say? We get down and dirty for the sake of the Message. The other fear I had was that my Troupe wouldn’t appear good enough to perform on that stage. We are a comprehensive powerhouse, but I honestly wasn’t sure if we would be accepted as equals. We are a group of faith-based performing artists that come from various backgrounds and our puzzle pieces fit perfectly to create movement that touches the soul. We unapologetically seek to reach an audience of ONE, but I couldn’t help but think that our colleagues wouldn’t understand us. I was emphatically wrong. Not only did they get it, but they enjoyed it! All it took was a resolve to stand in the face of fear, push it down and walk over it. Sounds easy, but it wasn’t. I just did it anyway. If I had not done so, I would have missed out on two beautiful milestones and someone could have have missed a moment they may have needed to experience. What is one thing that scares you, but you want to do it more than you’re afraid of it? I stand with you and pray for our boldness to run right over it. Will you get the tingle of timidity every now and then? Maybe. That doesn’t mean that you can’t conquer it, again and again. Peace & Thanks for listening and “see” you tomorrow for Day 3 of #bloglikecrazy! The number 6 represents the imperfections of man, labor, and is often used to indicate symmetry. There were 6 days of creation and the Creator made man on the 6th day. A family table often hosts 6 chairs. What a unpopular, yet fitting number to celebrate. In 6 years, we have disrobed and unmasked before each other, revealing the vulnerability of ministry – raw, beautiful, and free. Our paths were forged long before we formed a crew, and so were our tears. The struggles, the laughter, the prayers, the outpour of anointing… all of which encompasses the journey we chose to take together 6 years ago. I wouldn’t trade anything for June 5, 2012, when my hands shook with nervousness before each call to request your time and energy. Now, we breathe as a family of imperfect people on fire for God’s Love and Creative Expression. We are His Workmanship and it’s an honor to serve with you. My last Monday night rehearsal with UAB Gospel Choir was last week. Due to my work schedule, I couldn’t soak in all of the goodness of the director’s farewell semester, and honestly, I was sad and sentimental about it every Monday night for 3 months. You see, for a period time when I wasn’t going to church, Monday was my Sunday. It was my exhale of the week and my musical family reunion ritual. We learned music and history, but most importantly, we learned friendship and camaraderie. Students were treated like professionals in training, not underlings. It was rigorous, but respectful. The Class called UAB Gospel Choir turned from a mere repeatable credit hour to my saving grace and I was missing out on forging the last moments of it. So, last Monday, I soaked in the truth that for 16 years of my life, I was connected to this choir’s legacy as a student and an alumna. My heart poured there. My tears ran freely. My skills were sharpened. I was made into a better version of myself. That Monday night, I saw people I had not seen in years and laughed until my face hurt. It was beautiful. I guess you can say, I was reunited, although my heart never broke away. What or who are connected to spiritually that you can’t reach physically? Does the distance hurt? Do you feel inadequate without interaction? It’s OK. I get it. Set a date and reunite. Feed your soul with the goodness of fellowship. Invite the intimacy of connectivity. I don’t care of it’s a phone date, video chat, or grocery store run… reunite. Whatever the sacrifice, the result is priceless. 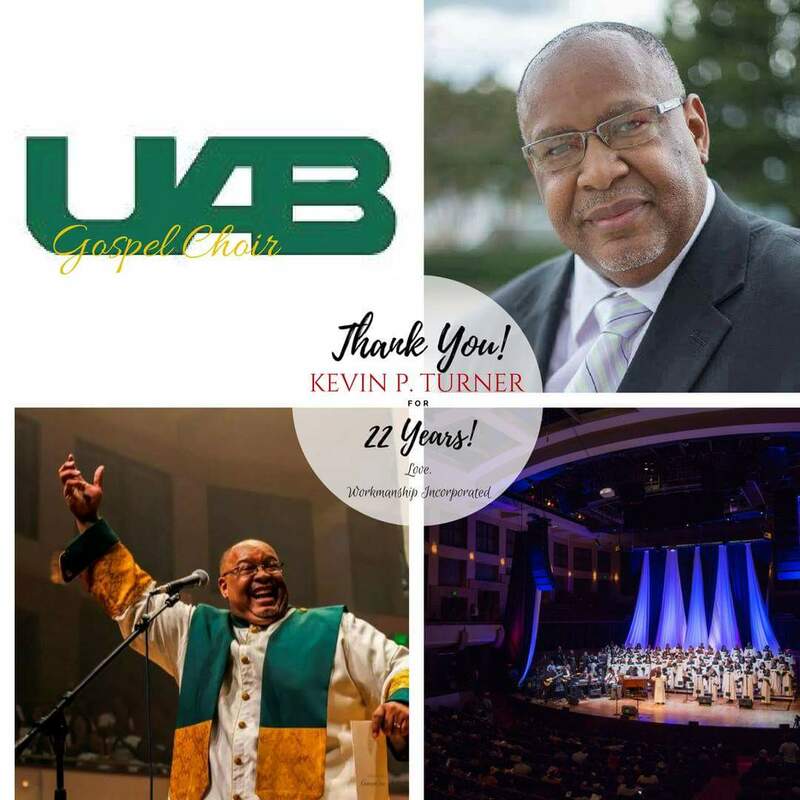 Thank you, Bishop Kevin P. Turner, for providing a safe place for us to grow and develop into the purposeful people we were designed to be. The harvest of your academic and musical seeds will multiply forever. I have the best creative team in the world. Give us space and time and we do extraordinary things, like create moving water, tumultuous trees, and a visual Bible story in seconds. On last Sunday afternoon and into late that evening, my performing arts troupe, Workmanship Incorporated, rehearsed for our upcoming performance at the UAB Gospel Choir Reunion Concert to be held at the Alys Stephens Center on Monday, November 13, 2017. I was torn between physical pain and supernatural will, but I made it. One of my teammates lives in another state and she drove into town to join us. Other teammates came from church, work, and family duties to give their sacrifice of dance as well. To check out a short clip of the rehearsal, click here. At one point in the rehearsal, I stepped back and just marveled at how fantastic they were. Willing and diligent to get it right so God could have complete control on performance day. No one complained. No one was belittled. No one was anxious to leave. We were on one accord. Everyone was pressing toward the mark and it was beautiful. I loved beholding the glory of God working in them behind-the-scenes. In a bigger perspective, many will never see what we go through at home in order to produce the fruit on our limbs in life. We have structured areas and danger zones where we get our lives together before heading out into the world. In the performing arts arena, the audience may see 10 minutes of creativity for 10 hours of preparation. It’s a labor of love and a gritty process, but well worth it in the end. That’s the essence of your life, your relationships, your dreams, your responsibilities. If you do it right, grit becomes part of your daily diet. It’s good for you and for those around you. It doesn’t let you quit or whine. It pulls you over the humps and having others with you that chew on the same stuff makes all the difference. So, there I was… with a front row seat looking at a dream realized from my 14-year-old self. Rehearsing with all of the energy we could muster. Laughing through trials and sharing our victories. And I realized then,the aftertaste of grit tastes good. In March of this year, I witnessed a beautiful blend of past and present. My fraternity brother was inducted into the Birmingham Police Department after graduating from the academy. Be it that he is my little-big brother (he towers over my 5′ 4.75″ frame), I was so proud when he shared the news and invited me to come to the ceremony. I had attended military and law enforcement events before, but unfortunately, most of them were funerals. This time, I was in the audience as a member of his support team and I was honored. Upon arrival to the designated room, it was clear that this was a family affair. Many people were just as excited as I was to be present for such a special occasion. Even children that may not have understood the magnitude of the moment were all smiles seeing blue police uniforms everywhere. There were sergeants, captains, and city officials waiting to honor the new graduates with their new badges and priceless pearls of wisdom. I found a good seat and waited with expectation for what would happen next. I’m used to attending events by myself, but this time was different. I felt out of place for a minute because I wasn’t with a pack. I didn’t come with a 15-piece cheering section, yet, I cleaned the lens on my camera phone and checked the front and back doors in hopes of getting a good photo on the first try. Families and friends were buzzing around like paparazzi waiting for celebrities. To us, that’s exactly what they were. They were our heroes and we were excited to see their debut. A short, petite female officer stood in front of the cadets like she was six-foot-four. I was immediately proud and wanted to raise my feminist fist. As she gave orders to stand at attention, recite prolific promises, and march forward, the room absorbed her command as well. Everyone seemed to be at spiritual attention. My fraternity brother marched by and I felt the wind of his maturity and pride. He was seriously motivated to uphold his vow and relieved to finish the first leg of his municipal marathon. The tears almost fell from my face when I realized that this was the same police department that tormented his ancestors – with water and other horrible means. The history of what I was watching flooded my soul and a for a brief moment, I was overwhelmed. Dignity arose within me for every freedom fighter, foot soldier, and civil rights leader ever to grace this God-given Earth. I didn’t feel militant. I felt regal. I felt strong. I felt American. My vision was blurry with teary pride as I watched each officer shake hands with superior officers, some of which were parents initiating their children with a solemn salute. This was the dream so many slaves had when their heads fell upon their pillows made of dirty cotton after surviving lashings they didn’t deserve. When marchers stood in the streets locked arm-in-arm, singing and chanting in the blood thirsty faces of evil, they imagined a mirror image of liberated faces on the other side. I couldn’t breathe easy for a few minutes. I couldn’t stop smiling for a few more. There was nothing more American than what I was feeling right then – a dream realized and an honor bestowed simultaneously. I blessed them in my spirit and prayed over their lives… that God would keep them alert and ready at every call and even when no one was in need of their service. I prayed for protection and wisdom and for the understanding of their families. The fact that something so ugly could metamorphosize into this moment made me proud to the recipient of their sacrifices. It was a social spit in the face of centuries of racial injustice. I was grateful. I was proud. I was filled. What makes you “feel” American? Moments like these do it for me. You need a session. Trust me. After an invigorating dance-in-the-dark party in February, I was all about having my private party on the night before my August 20th birthday. What better way to celebrate my fresh wind of feminism than with other Wonder Women? I hand-picked a few close friends that I thought would appreciate the unique experience and invited them to dance their heart in with me. When the dust settled, seven ladies were confirmed and I was elated to rock with them. Related Sidebar: I’m an Olympics fanatic. Seriously. I try to watch everything. You know how the U. S. Women’s Gymnastics Team is usually earmarked with a nickname? We’ve witnessed the Magnificent Seven (Atlanta 1996), the Fierce Five (London 2012), and recently in Rio, the Final Five to commemorate the retirement of legendary gymnastics coach Martha Karolyi. Epic. I decided to jump on board and nickname these seven sisters + our beautiful host Shannon. They were the Exceptional Eight and this new band of supersheroes were about to embark my birthday SOL ship voyage. Sidebar complete. I’m a thinker, so I reviewed the dynamics. Three of the attendees were my sorority sisters. Two of the eight ladies I knew since grade school. The remaining two women, I met in college. And Shannon? She was a sister on-site. Our kindred spirits kindled a positive energy that burned over emails and spilled over into our face-to-face encounter. I loved how she fit right into our type of crazy. I even had an icebreaker planned just in case my multiple circles needed some communicative coaxing, but as Shannon pointed out, they already had something in common…me. Each one of them represented a part of me that identified with them, so why wouldn’t they blend? I must admit. I was nervous because I wasn’t sure how the session would turnout for them, but it resulted in an explosion of laughter mixed with bursting sounds of pure joy and freedom. I couldn’t have asked for more. It was a beautiful blend. Soon, it was lights out and we danced the night away to a perfect mix of my favorite jams (Did I mention perfect?). We ate until our sweet tooths were satisfied. We shared words of love and humor and you could see the strings of sisterhood weaving among us. We were SOL-tied, a band of professional women that had worked hard during the day, but needed the unique forge of fortitude that night. One of my sisters even had to get up for work at 3:00 AM the next day, but was still energized when she woke up. It was that electric. I saw their faces relax and for a moment, we weren’t wives, mothers, students, caregivers…we were an assembly of queens drinking from the pool of cooling strength and being fitted in new armor for the world that awaited us. The shattered stress from our daily roles lie on pieces of pink paper around us and no one walked out in the same manner in which they entered. Everyone returned to the lobby a little taller, brighter, and ready to obliterate any obstacle in her path. We were walking with sunlight in our pockets and positivity in our hearts. Our steps had rays of sunshine beaming underneath as we matriculated to our night-kissed cars. To say that those dance steps charged our feminine energy packs would be an understatement. We may have put on the same shoes, but they didn’t feel the same. Peace, thanks for listening, and Happy Birthday to all of the August babies! We ROCK! There are few times when I travel backward in my mind and find nuggets of perfect synchronicity in a fraction of a second. Saturday was one of those times, so allow me to walk you through the steps. Bear with the chain link of events below as I bare my soul. It all began with an idea to have a fun-filled, let-your-hair-down kinda day for my performing arts troupe, which consists of experienced professionals in various industries. They’re amazing superheroes in their respective fields and on any stage of creativity. A beautiful dichotomy of talent if you ask me. This delicate balance needed a breeze of fellowship, so August 13th was set for Summer Fun Day at Avondale Park. I could hardly wait. One of our members attends graduate school out-of-state and was making the trek to spend time with the team, so I watched the weather closely to ensure that she could travel to us safely. I didn’t see some responses from my crew (which I later discovered was due to a technical glitch), so I considered canceling it altogether. After all, we had received bursts of thunderstorms every day that week and Saturday was going to follow suit. I decided to keep the plan based upon the forecast, and added some extra prayer to the meteorologist’s news. So glad I did. The weather was perfect. On the previous evening, we held rehearsal and one of our members brought up the notion of eating at Saw’s Soul Kitchen in Avondale, Alabama. I had never been, so I immediately was intrigued and ready to go. The dance of overcasting clouds and sunshine made for a mean game of volleyball and Uno. We were having fun, exactly what I prayed for. It seemed only fitting that we carry the good vibrations over to the restaurant. After releasing our table, the same friend that suggested Saw’s pointed our attention to a thrift store nearby that she loves to visit. Sozo Trading Company was the destined place. Being the economical giants that we are, we jumped at the chance to embark on another adventure. Like giddy children filled with wonder, we walked inside and immediately felt peace. Dakota greeted us with a smile and noticed our matching shirts. She inquired of our talents and we agreed to perform a human video before we left. Remember when I gave you the demographics of the team in THE PLAN? The challenge that comes with our creative make-up is that schedule clashes are inevitable and not everyone learns the same piece at the time it is taught. In this instance, there was also the factor that one of our members had not performed with us in over a year. So, the suggestions started flowing. “What about this?” “Were you here when we did that song?” “I don’t know that one, but I can learn it.” The communication about the business at hand resulted in my spirit being nudged to return to the first song I heard in my soul stereo – How He Loves Us by Jesus Culture featuring Kim Walker-Smith. It fitted the mission of Sozo perfectly, so I shared those thoughts with my team. So, in true Workmanship Incorporated anointing, we quickly forged as a unit and half of our quad learned the piece in the back of the store. The funny part is that no one batted an eye of curiosity or annoyance. They just shopped around us as if our full-bodied belonged in the setting. In less than 45 minutes, we were all caught up and ready to serve. We ministered. Right there inside of the front entrance doors. If you’ve never performed a human video, it requires all of your muscles to cooperate and be in sync with those around you in order to present the storyline clearly. Two of us were negotiating with our bodies about previous injuries, two of us had learned the piece in minutes, and all of us were in sync. It was beautifully amazing. As usual, we performed for an audience of ONE – the ONE who gives us Life and the ONE who needs it. Dakota recorded and took pictures. When the song was over and we expired all we had, Dakota was teary and patrons were nearby. A man approached us with watery gratefulness in his eyes and hugged us, thanking us for the message of Love. His courage to be touched is what sincerely touched me. An open masculine heart is said to be soft, weak, or feminine by society’s standards unless they’re crying about winning a championship, but at that moment… he felt loved and reminded, and that was all that mattered. Then, it dawned on me. He was my blessing. Dakota was my blessing. Austin and Amanda (fellow Sozo staff) were my blessing. The gentleman at the restaurant was my blessing. Steps 1 through 7 were the blessing that led to the makarios moment… this man hugging people he didn’t know because of a Message that we said silently. We were presented with the opportunity to eulogeó (to speak well of, praise, or bless) God in the presence of His people and it resulted as a makarios experience for ourselves and others (refers to the believer in Christ who is satisfied and secure in the midst of life’s hardships because of the indwelling fullness of the Spirit). That your plans are never yours. They always affect someone else, even when you don’t know it. And you’ll be better off letting God lead the choices you make because He always has a two-edged blessing waiting for you. Blessings are always simultaneously designed. They are never unilateral. To learn more about Greek words related to “blessing/blessed,” click here and here. I hope you enjoy the insight as much as I did.